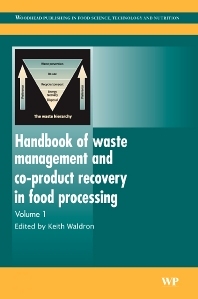 Part 1 Key drivers for waste management and co-product recovery in food processing: Waste minimisation, management and co-product recovery in food processing: An introduction; Consumer interests in food processing waste management and co-product recovery. Part 2 Optimising manufacturing to minimise waste in food processing: Chain management issues and good housekeeping procedures to minimise food processing waste; Process optimisation to minimise energy use in food processing; Process optimisation to minimise water use in food processing. Part 3 Key issues and technologies for food waste separation and co-product recovery: The importance of microbiological risk management in the stabilization of food processing do-products; Effects of post harvest changes in quality on the stability of plant co-products; The potential for de-structuring of food processing waste by combination processing; Enzymatic extraction and fermentation for the recovery of food processing products; Supercritical fluid extraction and other technologies for extraction of high value food processing co-products; Membrane and filtration technologies and the separation and recovery of food processing waste; Separation technologies for food wastewater treatment and product recovery. Part 4 Waste management in particular food industry sectors and recovery of specific co-products: Waste management and co-product recovery in red and white meat processing; Waste management and co-product recovery in dairy processing; Waste management and co-product recovery in fish processing; Recovery and reuse of trimmings and pulps from fruit and vegetable processing; High-value co-products from plant foods: Nutraceuticals, micronutrients, functional ingredients; High-value co-products from plant foods: Cosmetics and pharmaceuticals; Natural dyes from food processing wastes; Improving waste management and co-product recovery in vegetable oil. Part 5 Minimising disposal: Wastewater and solid waste management in the food industry: Treatment of food processing wastewater; Dewatering systems for solid food processing waste; Fermentation, biogas and biohydrogen production from solid food processing. The intensification of agriculture and food production in recent years has led to an increase in the production of food co-products and wastes. Their disposal by incineration or landfill is often expensive as well as environmentally sensitive. Methods to valorise unused co-products and improve the management of wastes that cannot be reused, as well as techniques to reduce the quantity of waste produced in the first place, are increasingly important to the food industry. With its distinguished editor and array of international contributors, Waste management and co-product recovery in food processing reviews the latest developments in this area and describes how they can be used to reduce waste. The first section of the book provides a concise introduction to the field with a particular focus on legislation and consumer interests, principle drivers of waste management. Part two addresses the minimisation of biowaste and the optimisation of water and energy use in food processing. The third section covers key technologies for co-product separation and recovery, such as supercritical fluid extraction and membrane filtration, as well as important issues to consider when recovering co-products, such as waste stabilisation and microbiological risk assessment. Part four offers specific examples of waste management and co-product exploitation in particular sectors such as the red meat, poultry, dairy, fish and fruit and vegetable industries. The final part of the book summarises advanced techniques, to dispose of waste products that cannot be reused, and reviews state of the art technologies for wastewater treatment. Waste management and co-product recovery in food processing is a vital reference to all those in the food processing industry concerned with waste minimisation, co-product valorisation and end waste management.